Total : 176 j. 01 h. 19 min. Temps à bord d'ISS ISS Expédition 23/24 173 j. 15 h. 16 min. April 15, 1960, Syzran’, Kuibyshev (Samara) Region, RSFSR (Russia). Farther: Boris Grigorievich Kornienko, 1928-1965, a military pilot, was killed in the aircraft accident. Mother: Faina Mikhailovna Kornienko, born in 1931, a pensioner. In 1987 he graduated from the evening department of Moscow Aviation Institute after S. Ordzhonikidze and got qualification as a mechanical engineer. Wife: Irina Anatolievna Kornienko (Savostina), born in 1958, a physician. HOBBY: running, swimming, winter bathing, athletics. From 1978 to 1980 he passed the basic military service in the air-transported troops of the Soviet Army. In 1980-1986 he worked as a militiaman. 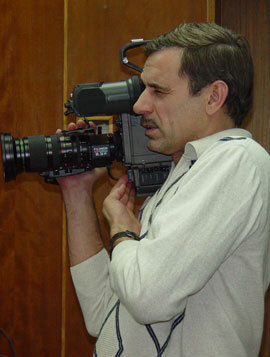 In 1981-1987 he studied at the evening department of Moscow Aviation Institute. In 1986-1991 he was an engineer of General Machine-Building Design Bureau (GMBDB) in Moscow. From October 1991 to December 1992 he was the OOO Transvostok Technical and Production Department Director. From January 1993 to April 1995 he was the LLC ESTE General Director. From April 1995 to April 1998 he was the 2-nd category engineer of RSC Energia. He worked in the department of the cosmonaut training for extravehicular activity. On February 24, 1998 he was selected as a candidate for cosmonauts by decision of the State Interdepartmental Qualification Committee and on March 23, 1998 by Order of the RSA General Director and Order of the RSC Energia President of April 10, 1998 he was appointed as a candidate for test cosmonauts of the RSC Energia cosmonaut corps. In 1998-1999 he passed a course of general space training and on December 1, 1999 he became qualified as a test cosmonaut by decision of the Interdepartmental Qualification Committee. From August 2001 to February 2003 he passed training under a program for the ISS flight engineer and the Soyuz TMA TSC commander of the ISS-8 backup crew for launch by the Shuttle Orbiter. 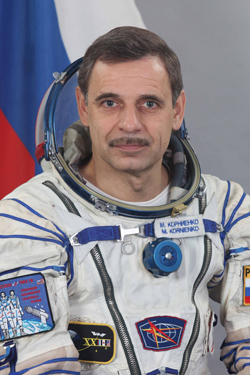 From March 2003 to August 2005 he passed training within the cosmonaut group under the ISS program. From September 2005 to January 2006 he passed training in the International group for flights onboard the ISS. Since February 2006 he has been passing training within the ISS-15 backup crew as the ISS and the Soyuz TMA TSC flight engineer.